Quick links: Main Programme, Beginners Programme, Bee Craft Programme. All last years main lectures can be viewed on YouTube from Lecture Videos. There is no booking for lectures, seats are available on a first come first served bases. 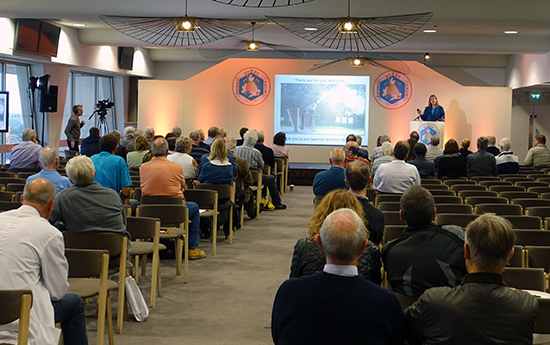 Please be aware that National Honey Show Members and those with a daily admission ticket can attend lectures and book into Workshops. The lecture programme may change for a variety of reasons. Substitutions may have a different topic from that intended and with a different speaker. 16:30 Clarence Collison: Examining Combs- What Do They Tell You? 10:30 Kirsty Stainton: EFB/AFB DNA analysis of infected colonies? 12:30 Roger Patterson: What is Going Wrong With Our Queens? The Beginners Programme is intended for those who are in their early years of beekeeping, perhaps up to two years experience. The topics have been carefully chosen as being relevant to those new to the craft, with many of the things covered that beginners are often confronted with in their early years. The presenters are experienced beekeepers who are used to teaching, so they will pitch their presentations at the relevant level, with little or no overlap. It is strongly recommended that beginners attend all presentations and that local beekeeping associations or groups encourage their members to attend. It may be attendees are visiting the National Honey Show for the first time, so the programme has been arranged to allow time for beginners to see the exhibits and visit the trade stands. Beginners who have enjoyed these lectures in the past, may wish to enrol for Workshops, where the topics are covered in more detail. Bob Hogge talks on Asian Hornets in Jersey. Asian Hornets have now been discovered over a wide area and are a threat to all of us. Bob Hogge, a Jersey beekeeper, will share experiences from Jersey where these hornets are now established. Jack Hassett received his BSc. (Hons) in Pharmaceutical and Forensic Analysis from Limerick Institute of Technology in 2013. During his degree he studied a wide variety of scientific practices and has experience with an array of various instrumentation. 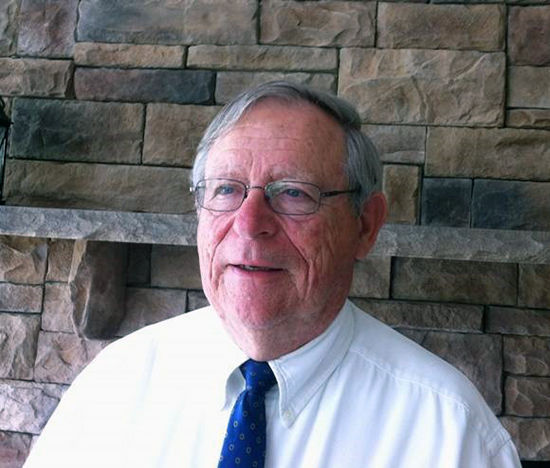 Prior to completion of his degree, Jack conducted a study into the “Factors affecting the Transfer of DNA” under criminal circumstances, this study examined the possibility of both primary and secondary transfer of DNA. Jack is currently completing his Ph.D. in the “Genetic Analysis of the Irish Honeybee” under the supervision of Dr Mike Geary and Dr Liz Moore. The aim of which is to determine the population and level of hybridisation of the Irish Honeybee. 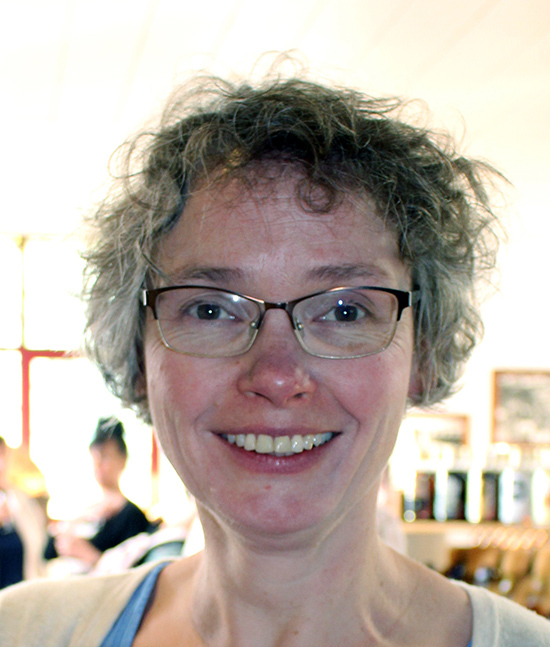 Milly Carmichael is the Chair of Transition Marlborough - part of the now global Transition movement of towns, cities and communities working together to prepare for a world less reliant on fossil fuels and more connected with networked local economies and more sustainable lifestyles. Milly has a background in nursing, youth work, training and gardening. In more recent years she has developed her interest in permaculture and its application to human systems. The Bee Roadzz is a project that has emerged through partnership with environmental groups in neighbouring towns and villages and serves as an example of a local, joined up response to the 2014 National Pollinator Strategy and the newly proposed Protection of Pollinators Bill. Victoria Buswell gained her undergraduate degree in bioscience from Canterbury Christ Church University. While studying she also gained experience in molecular techniques via an internship involving biological controls in pear orchards. Victoria is currently working towards her PhD in molecular ecology investigating the phenotypic and genomic basis of local adaptation in the UK native honey bee (Apis mellifera mellifera). Her project relies heavily on the involvement of beekeepers throughout the UK and is in partnership with B4 a community interest company based in Cornwall. Michael-Thomas Ramsay has an unndergraduate degree was in Conservation Biology that was obtained from the University of Lincoln. He went on to study a Masters by Research in Biology, where he studied how the environment experienced throughout an organism’s lifetime affects their brain size, behaviour and cognitive ability. After 4 months working as a research scientist for a Lincoln based crop company, he started his PhD with Dr Martin Bencsik researching the pulsed vibrational messages of honeybees. 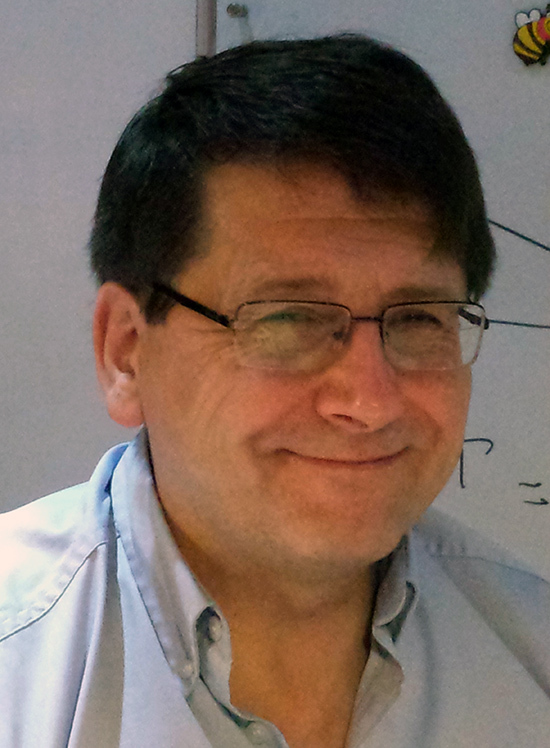 He has since given talks at international conferences both overseas and in the UK, published 2 papers and managed another BBKA funded project at NTU. Luke and Suzie Hutchinson established Northumberland Honey Co in 2015. Fast forward to 2018 and not only has the number of bees they keep grown but they have also seen the growth of méthode traditionelle (Champagne method to most!) Sparkling Mead, now the mainstay of the business where 90% of the honey produced by the bees of Northumberland Honey Co is consumed! Michael Smith is a postdoctoral researcher in the Department of Collective Behaviour at the Max Planck Institute of Ornithology/University of Konstanz. His research focuses on movement patterns in honey bee colonies, and how individual bees detect the developmental state of their group. Michael first began beekeeping in 2005, while attending The United World College of the Atlantic, in St. Donats, Wales. He continued beekeeping during his undergraduate degree at Princeton, while also conducting honey bee research at Wellesley College with Heather Mattila. 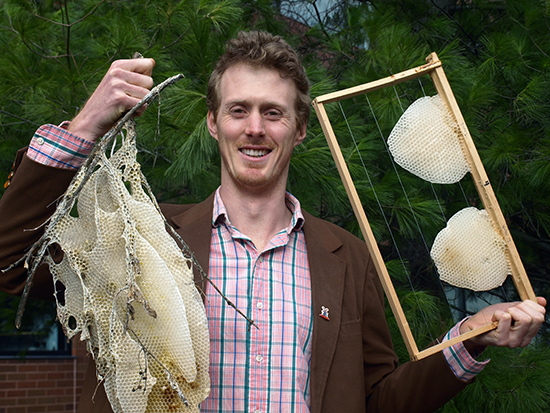 In 2017, Michael completed his PhD in Tom Seeley’s lab at Cornell University, where he studied growth, development, and reproductive investments in honey bee colonies. Presentation: "How does a bee detect her colony's size?" Presentation: "Seasonal shifts and uncertain futures: how honey bee workers manage their drone comb"
We all recognize (and some despise) drone comb in our honey bee colonies. But what do the bees actually do with their drone comb? It’s not just rearing drones continuously, I guarantee. This talk will be presented in two acts. The first act will look at how workers change the way they use their drone comb throughout the year. The second act will look at how colony-level uncertainty changes the way that workers invest in comb infrastructure. Both talks will connect back to the idea of reproductive investments, and how investment priorities change with the external environment, and internal conditions in the colony. Presentation: "Honey bee sociometry: tracking honey bee colony growth from birth until death"
Sociometry is the description and analysis of the physical and numerical attributes of social insect colonies over their lifetimes. Sociometric data, such as worker number and nest size are essential for understanding how colonies develop, but these data are rarely collected. Even honey bees, the most intensively studied social insect, has never received a broad-scale sociometric study. In this talk, we will follow four colonies throughout their lives, from when the colonies began as swarms in 2012, to when they died in 2014. It’s amazing what you can learn just by watching. I promise this talk will be more than just me reading numbers from an excel spreadsheet. Beekeeping is a skill learned through direct mentorship. For new beekeepers, it can be hard to find experienced and knowledgeable mentors. For potential mentors, it can be hard to know whether it’s worth it to invest time in a potential mentee. Through high school, university, and graduate school, I’ve established beekeeping clubs using the “College Beekeeper” model, which allowed me to learn beekeeping, teach beekeeping, and recruit student researchers. In this talk, you’ll learn how to setup a beekeeping club at your local educational institution, how to keep it from taking over your life, and why mentoring new beekeepers is worth it. Remember, most of us will eventually die, so you might as well teach someone the beekeeping tricks you’ve learned. After a career including instructing Outdoor Pursuits in Yorkshire, Head of Physical Education in Singapore and BANES, gaining an MEd at Bristol University and a Diploma in Counselling at Reading University I moved from teaching to work for a charity involved in sustainable agriculture in Africa. It was then I got my first hive and with Ted Hooper’s book in one hand investigated the boxes. I joined a club and increased my knowledge working through the BBKA modules, microscopy and husbandry exams to gain the Master Beekeeper qualification. What I love about bees is that they do not read the books and keep us on our toes. Presentation: "Honey Bees; Foraging and Feeding"
A brief look at why bees forage, what they bring back to the hive and how they collect it. We will look at the collection of pollen, the effect on the flowers visited and the communication within the colony to recruit and direct others to the task. The talk will also consider the important role of the beekeeper and how he/she can assist the bees. As part of my undergraduate degree program majoring in entomology, I took my first course in beekeeping in 1966 which stimulated my interest in bees. During my Master’s program, I studied nectar secretion and how it affects the activity of honey bees in the pollination of hybrid pickling cucumbers. This research area was continued during my PhD program and was concerned with the interrelationships of honey bee activity, foraging behavior, climatic conditions and flowering in the pollination of pickling cucumbers. Throughout my career at The Pennsylvania State University and Mississippi State University, I have served as an Extension beekeeping specialist, taught beekeeping, trained graduate students, written numerous beekeeping publications, published two books and conducted many educational programs for the beekeeping community. For several years I chaired the “Master Beekeeper” certification program of the Eastern Apicultural Society of North America. I write a monthly column “A Closer Look” and prior to that “Do You Know” for Bee Culture magazine. 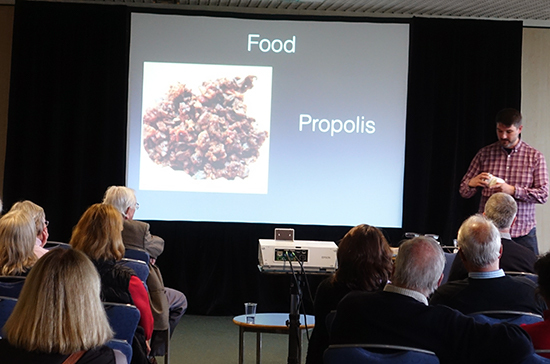 Presentation: "Applying The Basics Of Honey Bee Biology"
Understanding bee biology is the foundation of colony management. Virtually all bee activities are directly stimulated and coordinated to a large degree by pheromones. The distribution of pheromones within the colony by the workers has numerous impacts on bee biology i.e. rearing of queens, maintaining the worker caste and affecting foraging behaviour. Examining brood patterns can aid in determining the overall condition of the colony, quality of the queen, colony strength, healthiness of the bees and inclination to swarm. Observing basic bee behaviours will aid the beekeeper in making timely management decisions. Presentation: "A Closer Look At Factors Affecting Queen Quality"
The quality of the honey bee queen is directly related to the development and productivity of the colony. There are numerous factors that can affect queen quality. In recent times many beekeepers report that queens are superseded soon after they are introduced into a colony. We will review several factors that may be responsible for this decline in queen longevity and quality. In addition to looking at her basic biology, we will develop answers to two basic questions: 1) how can you determine if you have a good queen? And 2) What makes a good queen? This will be the second presentation in the "mini programme". Presentation: "Examining Combs - What Do They Tell You?" Examining the colony brood nest is an important aspect of colony management. Combs are the basic structural unit of the hive; used for reproduction, food storage and can serve as a disease reservoir. Examining brood patterns can aid in determining the overall condition of the colony, quality of the queen, colony strength, healthiness of the bees, and inclination to swarm. Presentation: "The Glandular System of Honey Bees"
Virtually all bee activities are directly stimulated and coordinated to a large degree by hormones and pheromones. Secretions of both endocrine and exocrine glands of queens and workers are tied directly to the division of labour within the worker caste, social organization and to factors that regulate colony development. These secretions are associated with bee behaviour, communication, regulation of bee development and metabolic processes, defence and brood nest establishment. We will examine various factors of the environment and nutrition that impact the production of chemicals associated with these glands and how they ultimately affect colony development and productivity. 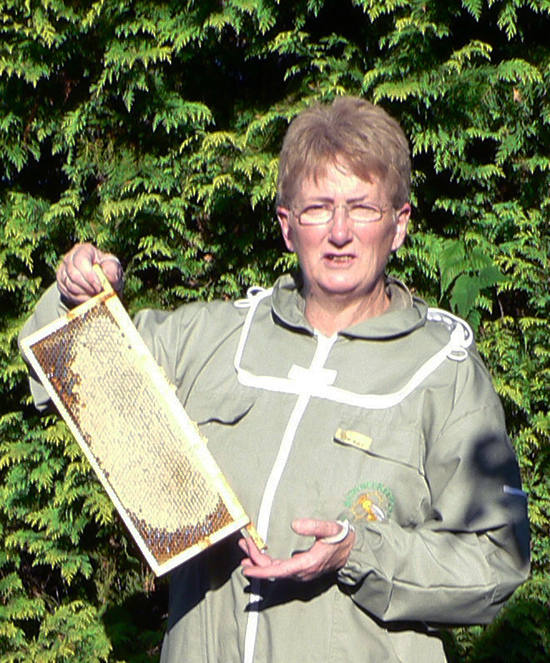 Lynfa lives in Aberystwyth and has kept bees with her husband, Rob, for 13 years. During this time she has worked her way through the BBKA assessments to become a Master Beekeeper. She now enjoys sharing the information she has learned with other beekeepers and takes an active role in teaching new beekeepers in her local association. Lynfa is a regular contributor to the BBKA News magazine. Lynfa currently has approximately 15 colonies which she mainly manages for honey production, something which often proves challenging in a wet West Wales! In addition she raises her own queens and uses these to produce nucleus colonies and to replace her own stock. Presentation: "Honey bee communication - a look at how bees share information and communicate with each other"
Honey bees operate as a colony, not as individuals, and in order to do this effectively they need to know what each other is doing. Honey bees have developed methods to share detailed information that enable them to perform their tasks with effortless efficiency. This talk will look at some of the mechanisms that bees use to communicate and share information with each other. This will include their dance language and how they convey complex directions through simple dance moves as well as delving into the chemical world of pheromones. Bob has been keeping bees since the Big Bang (it seems), currently managing 9 colonies in 14x12 WBC’s, in 3 quite different apiaries. He was a Seasonal Bee Inspector for 6 years, is a holder of the NDB and the person with responsibility for education and training within the Medway Beekeepers Association. He is particularly involved in providing training opportunities for “Improver” beekeepers through both theoretical and practical handling courses. Bob’s scientific training as an analytical chemist impacts his whole approach to beekeeping; experimentation and record-keeping are fundamental to chemistry and beekeeping! As beekeepers, we have responsibilities to the livestock in our care, responsibilities that we discharge through active management of the bees. This talk looks at various aspects of the ways we can work successfully with our bees, recognising their needs while keeping within the constraints we might have set. What are the key issues we need to be aware of? What are the key skills we need to develop a successful partnership? This talk aims to make you think about what you want from your bees, and to set you on a path to achieving that. 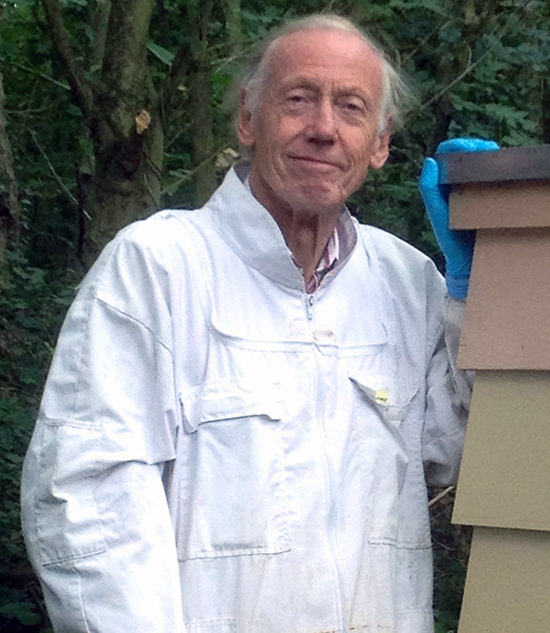 Roger Patterson started keeping bees in his native West Sussex in 1963. He is a practical beekeeper who has learnt a lot by observing bees and beekeepers. Roger has been a demonstrator at the Wisborough Green BKA teaching apiary for over 40 years and is currently the Apiary Manager, where there are normally more than 30 colonies for tuition. For about 15 years he had 130 colonies of his own, but is now down to around 25. 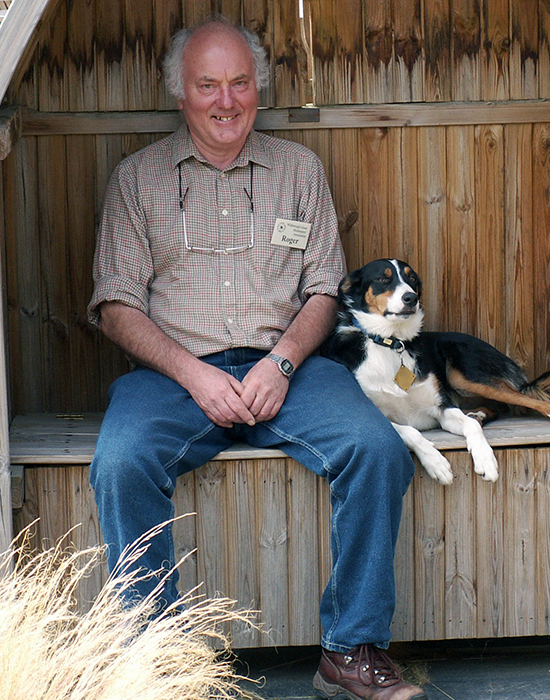 In addition to writing, Roger speaks and demonstrates widely on the practical aspects of beekeeping, where he is usually seen with his well known border collie Nell. He owns and runs the Dave Cushman website, which is considered to be one of the world's most comprehensive beekeeping websites. An overview of the current queen problems that are detailed Here with some suggested ways of dealing with them. Despite denial by some “experts”, many beekeepers worldwide are experiencing unexplained queen failures, queens “disappearing” and the supersedure of young queens during the summer. This could mean that colonies may swarm on supersedure cells, or if not dealt with, can be terminal for the colony. These problems have only recently appeared at a high level, since about the turn of the century. The problem is that newer beekeepers regularly see problems and don't understand they aren't natural. There has been little research done and the best the beekeeper can do is recognise the symptoms and manage their bees accordingly. This presentation is regularly updated and gives examples of real cases. This will be the first presentation in the "mini programme". Presentation: "Dead Bees Don't Buzz: Surviving the Winter"
This talk could have simply been called "Wintering", but so many speakers have that title, often just giving the impression that wintering is something you don't think about until the autumn. Bees are preparing well before winter and this talk encourages beekeepers to do the same, but from a position of understanding how a wild colony does it. Before varroa, bees survived the winters very well. They had to, as the survival of the species depended on minimal winter losses. In managed colonies winter losses are much higher than they should be. Why is that? Are beekeepers doing something wrong? What can we do to lessen the chances of losses? Should we try to reduce losses? Are losses a good thing? These are all questions that successful beekeepers should be asking themselves. There are many things beekeepers can do to help the colony survive into spring, some are mentioned in this thought provoking presentation. Derek is a researcher into the differences in heat transfer between man made and natural honey bee nests at Leeds University School of Mechanical Engineering. Derek’s fascination with honey bees over the last 7 years, is that the deeper you delve into how they exploit the physics of heat, the more impressive the feats of honey bees becomes. Presentation: "The honey bee and the mosquito - a history of insulation and ventilation"
For over 160 years beekeepers have pondered over should one insulate or ventilate a bee hive. This talk will look at the history of adding insulation and ventilation, looking at how world wars and the world economy influenced the arguments about insulation, ventilation and hive design. Finally bringing it up to the present day by looking at what 21st century engineering research can tell us about our bee hives. Chris is Commercial Manager for Glass Technology Services (GTS) Ltd – which carries out glass research and analysis as well as providing accredited testing for glass products across glazing, domestic ware and packaging (food, beverage, personal care and pharmaceutical). Chris spent the early part of his career hands-on in container glass manufacturing and filling – getting to know all stages of the process first hand. His various roles at GTS Ltd have seen him work alongside some of Europe’s most highly regarded glass chemists, technologists and product performance experts. 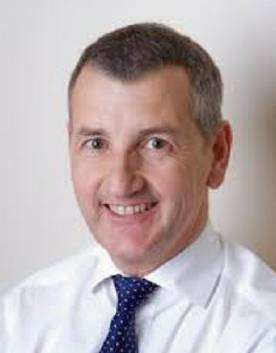 He now oversees the development and planning of GTS Ltd’s testing, research and consultancy business. With a particular focus on the container glass industry – he is continually talking to glass manufactures, equipment suppliers, brand owners and retailers. 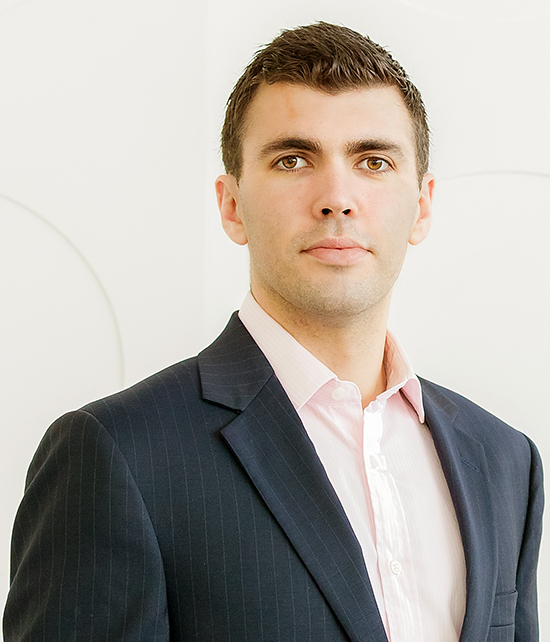 His work includes product development, process improvement, market analysis and corporate due diligence in the UK, Europe, Africa and Asia. While Chris is an expert on glass packaging, the same cannot be said of his beekeeping knowledge! 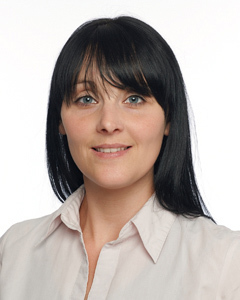 Presentation: "Why glass remains the gold standard for honey packers large and small"
Kirsty Stainton is a senior scientist with Fera Science Ltd. She started her scientific career with a Ph.D. from Oxford University on the use of genetic modification for control of insect pests. Her post-doctoral research involved studying an insect bacterium called Wolbachia and its effects on the host. She joined Fera Science in 2016 where she has worked on research involving Asian hornets and honey bee viruses. Presentation: "AFB/EFB typing and Chronic bee paralysis virus"
Mike has been keeping bees for approximately 8 years and has 10 hives. He is working his way through the BBKA module exams and regularly teaches through his own association. Outside beekeeping Mike is a consultant surgeon and has always had an interest in the medical aspect of beekeeping. Presentation: "The Bee Sting and its effect on Humans"
The presentation will look at the mechanisms and actions of the bee sting and the chemical implications of this. It will also look at the human defence mechanisms and the normal response to a bee sting. We will then spend some time looking at the danger aspects (anaphylaxis) of the bee sting and will conclude with first aid treatment of normal bee stings, how to recognise anaphylaxis and how to deal with it as a novice.